The first G7 summit was held in 1974 in the Chateau de Rambouillet – a grand feudal palace in France. The purpose of that summit was for the G7 states to find a common strategy to tackle the Opec oil cartel and the NIEO – the New International Economic Order. Opec had limited supply to raise the price of crude oil, which threatened economic growth in advanced industrial countries. The NIEO had passed in the UN General Assembly with support from the Third World states. It called for a new international economic and political architecture to benefit the poorer nations. The G7 was created to break both Opec and the NIEO. It has largely succeeded. After the collapse of the USSR, the G7 drew Russia into its orbit to become the G8 by 1994. The point was to create sufficient consolidation so as to prevent the emergence of a new economic and political pole on the planet – represented by the rise of China. With the world financial crisis in 2007, the threadbare West turned to the Brics bloc (Brazil, Russia, India, China, South Africa) for financial liquidity. The promise was that if these states, particularly China, delivered funds to the world financial system, the G8 would be suspended in favour of the G20. China paid up. That assurance of closing down the G7 was hastily set aside when the banks felt secure. The G20 was adjourned. Western confidence rose in the aftermath of the 2011 Nato intervention in Libya. It was now thought that not only was the financial system saved, but that humanitarian interventionism provided the West sufficient legitimacy to use its superior military force to order the planet. If the Soviet empire is long gone, the West’s ambition to drive world policy remain intact. Contradictions in G7 policy affect Europe far more than the US – Two big energy suppliers to western Europe, Iran and Russia, are hurt by sanctions promoted by the US through the G7, and Libya, another big supplier, saw its institutions destroyed by the NATO war and its aftermath. 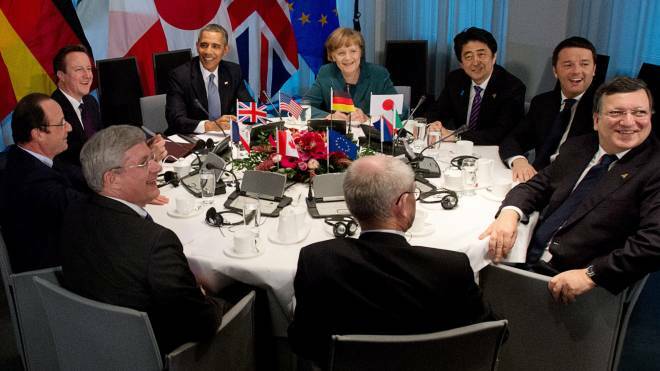 Europe bears the cost of the G7 excesses. The German chancellor, Angela Merkel, could very well have asked Obama if he wanted to wreck Europe’s economy in pursuit of his wrong-headed ambition to perpetuate American hegemony. The G7, as I discovered while researching my book on the forum, The Poorer Nations, often does not make public its most important debates. Its public pronouncements in the 1970s were gestures about stability and order. Privately, the leaders discussed in practical terms how to trounce Opec and the Third World bloc by any means necessary, including creating instability. At the most recent meeting, the masters of the universe pledged to phase out fossil fuels by the end of the 21st century – 85 years from now – and end poverty by 2050. There was no programme of action, only empty pledges. What was discussed in private would have been of far more interest, but we will have to wait a few decades to read the transcripts of the private meetings. Standing in the anteroom, awaiting an audience, was the prime minister of Iraq, Haider al-Abadi. He was told that the G7 had “agreed to work together to further combat terrorism”. How would they do so? The G7 had no clue. “We don’t yet have a complete strategy,” said Obama in his concluding remarks, “because it requires commitments on the part of the Iraqis”. For a year now, the US and its allies – backed by the G7 – have been bombing Iraq and Syria, but it seems this has been without any strategy. “We don’t yet have a finalised plan because the Iraqis haven’t given it to us yet,” said Obama. The masters of the universe claim the right to determine planetary affairs, use military force as it suits them, and yet show utter disdain for their subordinate allies. Obama turned away from Abadi, who seemed to be eager to say more. Obama fell into an animated discussion with the Italian prime minister, Matteo Renzi, and IMF chief Christine Lagarde. Abadi stood around. No one took note of him. He eventually walked away. He did not realise that he had been dismissed when Obama turned away from him. The masters of the universe were busy with each other. They have currencies to protect and countries to bomb.